If you have an interest in food science then a scientist worth knowing about is Sir Frederick Gowland Hopkins. He was a British biochemist who received the 1929 Nobel Prize for Physiology or Medicine together with Christiaan Eijkman. They were given the prize for their work on the discovery of vitamins or what was then called “essential nutrient factors” which are essential in animal diets for good health. 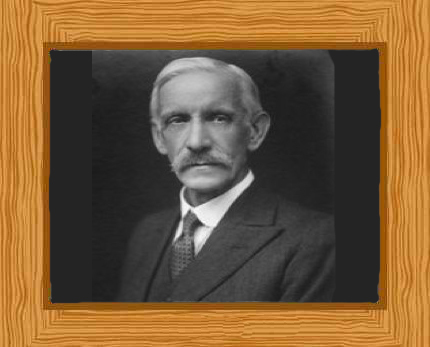 Frederick Gowland Hopkins was born on 20 June 1861 in the seaside town of Eastbourne, England. His father, Frederick Hopkins, was a bookseller in Bishopsgate Street and had a keen interest in science. His mother was Elizabeth Stafford (neé Gowland). Frederick’s father died when Frederick was an infant and he moved, in 1871, with his mother to live with his maternal grandmother and his uncle in Enfield, north London. As a child Frederick showed an affinity with literature and was not particularly interested in science although he did study life on the seashore when his mother gifted him with a microscope. It was said that he spent more time reading and writing rhymes than with scientific pursuits. He even speculated later in life that had he been given encouragement he might have become a naturalist or a classical scholar. This doesn’t mean that his love for literature went to waste because his abilities added much color and depth to his scientific works and addresses. Frederick attended the City of London School and at the age of fourteen transferred to a private school. Reports showed that he was very good at school and excelled in many subjects. He was awarded the first-class prize in chemistry during the school year of 1874. He also received a science prize as a result of an examination given at the College of Preceptors and when he was just 17, he wrote a paper on the purple vapor ejected by the bombardier beetle that was published in “The Entomologist”. Initially Hopkins worked as an insurance clerk for 6 months and then he apprenticed with a consulting chemist who encouraged him to take a course in chemistry at The Royal School of Mines under Edward Frankland. Hopkins then attended University College in London, undertaking an Associateship Exam at the Institute of Chemistry. Hopkins did so well that Sir Thomas Stevenson, a Home Office Analyst and lecturer at Guy’s Hospital on forensic medicine, employed him as his assistant. Hopkins was just 22 at the time and he took part in several legal cases that were of utmost importance. In 1888, Hopkins decided to obtain a degree and made it a point to graduate in the shortest time possible. In 1888, he enrolled at Guy’s Hospital in London as a medical student and was awarded the Sir William Gull studentship. During his studies, he received honors in Materia Medica and achieved a Gold Medal in Chemistry. Hopkins obtained his BSc degree in 1890 and in 1894 he graduated from his medical course and proceeded to teach toxicology and physiology at Guy’s Hospital. He taught there for four years and for two of those years, he was also in charge of the Clinical Research Association’s Chemical Department. In 1896, Hopkins and H.W.B Brook published their work on halogen derivatives of proteins. He also worked with S.N. Pinkus, researching crystallization of blood albumins. While he was attending a meeting at the Physiology Society at Cambridge in 1898, Hopkins met Sir Michael Foster who invited him to move to Emmanuel College at Cambridge University. Hopkins was invited to Cambridge to become lecturer on chemical physiology. At that time biochemistry wasn’t yet recognized as a separate branch of science; Hopkins accepted the offer. He was given a salary of £200 for his lectureship but he managed to supplement his income by giving tutorials and supervising undergraduates. By 1902, Hopkins was promoted to a biochemistry readership at Trinity College, Cambridge. Suffering from overwork and a rare spell of ill health in 1910, he accepted a non-lecturing position as a Fellow of Trinity College, Cambridge. He became professor of biochemistry at Cambridge University in 1914 and in the same year the department of physiology moved into large new buildings. In 1921 he was elected to the newly founded Chair of Biochemistry at Cambridge University, a position Hopkins held until he retired in 1943. Hopkins had many outstanding contributions to science but perhaps his greatest contribution was discovering a method for isolating the important amino acid tryptophan in 1901 and identifying its structure. He conducted animal feeding experiments and research on the nature of amino acids necessary for a mammalian diet. This led him to realize that unknown substances present in natural foods, now known as vitamins, were essential for animal nutrition. His findings were published in the 1912 Journal of Physiology and he was awarded the 1929 Nobel Prize jointly with Christiaan Eijkman of Holland. Additionally, in 1891 he devised a method for determining uric acid in urine, which remained standard procedure for many years. He discovered pterin, a chemical compound essential to the coloring of butterfly wings. In 1907, Hopkins together with Walter Fletcher showed that working muscles accumulate lactic acid. Hopkins also successfully isolated glutathione and showed that it was a tripeptide comprising of three amino acids; cysteine, glutamic acid, and glycine. He demonstrated that it was essential to enable cells to utilize oxygen. In 1925, Frederick Hopkins was granted Knighthood and in 1935 he was the recipient of the Order of Merit. He was awarded a royal medal in 1918 and the Copley medal in 1926. Hopkins married to Jessie Anne Stevens, a nurse, in 1898 and they had two daughters and a son. One of them, Jacquetta Hawkes, became a renowned author and archaeologist. Hopkins died at the age of 85 on 16th May, 1947.